What is global inequality? How can it be measured? What are the major trends and patterns? What are the implications of global inequality for the world economy and multilateral governance? What role does and should inequality play in national and international policy-making? In this comprehensive overview, the authors address these key questions. They examine the major issues that need to be confronted in conceptualizing, measuring and analysing contemporary patterns of global inequality. In addition, they explore the implications of these patterns for politics and public policy. In explaining the complex global patterns of social stratification, they highlight an intensive debate about whether and to what extent inequality matters. The book also addresses this debate, and seeks to set out the major alternative positions. The book’s authors include many of the most distinguished figures in the field, including David Dollar, Gøsta Esping-Andersen, Nancy Fraser, James K. Galbraith, Ravi Kanbur, Branko Milanovic, Thomas W. Pogge, Bob Sutcliffe, Grahame F. Thompson, Anthony J. Venables, and Robert H. Wade. This book will be of great interest to students in politics, sociology and international relations as well as to all those interested in this key topic. Ayse Kaya is a Research Assistant at the London School of Economics and Political Science. David Held and Ayse Kaya. 3 The Unequalled and Unequal Twentieth Century. 4 Globalization, Poverty, and Inequality since 1980. 5 Should We Worry About Income Inequality?. 7 Global Inequality and Global Macro Economics. 8 Global Inequality, the ‘Great Divergence’ and Supra-National Regionalization. 9 Spatial Disparities and Economic Development. Ravi Kanbur and Anthony J. Venables. 10 More Inequality and Fewer Opportunities?. Structural Determinants and Human Agency in the Dynamics of Income Distribution. 11 Reframing Justice in a Globalizing World. "This book offers a rich and diverse menu of perspectives on global inequality. There is no better place to start if you want to understand why so many intelligent people disagree so vehemently on the facts, their interpretation, and what to do about them." "Resentment of global inequality is emerging as one of the principal threats to globalization – but just how much inequality is there, how should it be defined, why has it happened and what can be done? This timely series of essays by the leading protagonists is the best survey of the arguments and evidence so far – the crucial source book on the global inequality debate." Comprehensive overview of global inequality with contributions from some of the top names in the international field. This collection examines key questions including the measuring global inequality, the global economy, the key trends in global poverty and its role in policy making. Lively and accessible this book will appeal to students and scholars alike. This book not only discusses the questions in the debate, but sets out potential solutions. 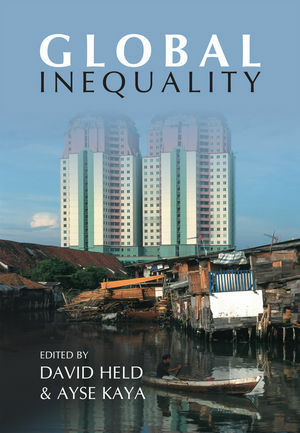 Wide ranging and rigorously argued, this book will be essential reading for anyone concerned about global inequality.